Gentrification is a process in urban neighbourhoods which results in poor people and the businesses that serve them being pushed out by richer people while property values, taxes and rents increasing. It often happens when a neighbourhood is “upzoned”, or when city regulations change to allow taller and denser buildings in an area. Woodwards is a massive development with 536 condos, 125 units of welfare rate social housing, 75 units of mostly middle income housing, a Simon Fraser University campus, City offices, a bank branch, a drug store, and a high end grocery store. Before Woodward’s and accompanying condos were built the western section of the Downtown Eastside was a majority-low-income area. In the 2006 census the highest percentage low-income population area of the Downtown Eastside was Victory Square; with over 70% low-income residents. At the time, the neighbourhood was full of old single room occupancy (SRO) hotels housing people on very low welfare and disability incomes. Woodwards opened in 2010. In this poster Woodwards is depicted as a battleship floating on a sea of money because people involved in the project made a lot of money, especially selling condos. 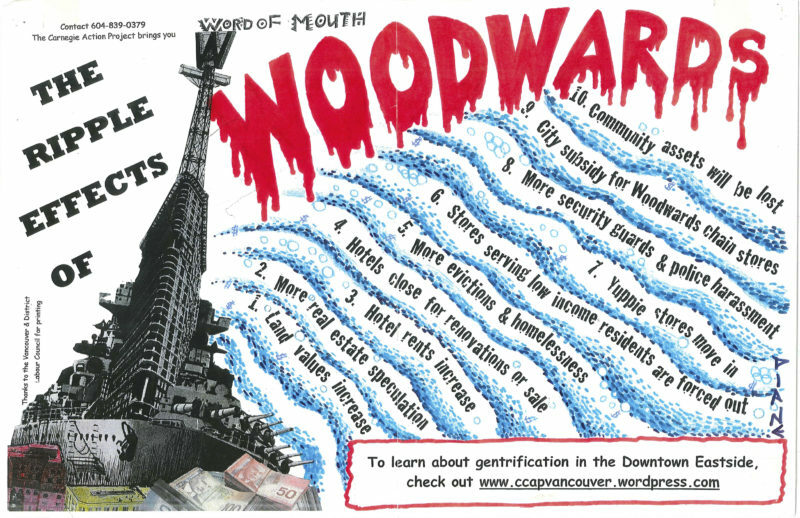 The poster shows the ripple effects of a development like Woodwards. Land values in the surrounding area increase; there’s more real estate speculation; rents increased in the SRO hotels that surround Woodwards and some hotels closed for renovations or for sale. There are also more evictions and more homelessness as landlords convert their hotels to suit richer tenants; stores serving low income residents are pushed out by high taxes; yuppie stores catering to the condo residents move in; there are more security guards and police harassment of the low income community; chain stores that serve the condo residents get a tax break but stores that serve the poor don’t. As a result of all this, the good things about the low income community, the sense of community and acceptance, places to shop that low income people can afford, a feeling of being at home in your own neighbourhood, are lost.